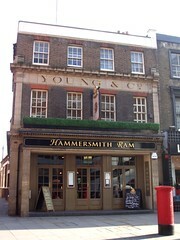 An excellent Young's pub in Hammersmith, as the name suggests. There's a cosy atmosphere to this place that hasn't been overly affected (like other Young's pubs have been) by trendy gastro-gentrification. The pub offers food but remains a great place for a quiet beer in the evening in a pleasant environment free from music or TVs. Seating is on several levels stretching back to a rear area set aside for dining. The bar is up a few stairs just behind the front room, and there's a selection of tables, some more hidden away than others, and some very large. There's also a small beer garden area out the back. The bar has three or four handpulls for ale, with the usual Young's suspects (ordinary, Special, Kew) available on Ewan's September 2009 visit. Food is served noon-10pm Monday to Saturday, and noon-9pm Sunday. There's a good range of events happening, including a Sunday evening Irish music session from 8pm, and a pub quiz on Tuesdays with cash prizes. More details are available on their website. Last visited by Ewan, 21 September 2009. Opening hours and food times taken from website, October 2009. Last edited 2013-05-10 07:19:30 (version 5; diff). List all versions. Page last edited 2013-05-10 07:19:30 (version 5).